About 5 years ago, I took my in-laws on a three week tour of the Northeast. Near the end of our journey, we went to New York City. At the end of one day, we wandered into a cocktail bar where the music was so loud I could not hear anything my father in law was saying. What a relief to get a load off our feet after walking around Manhattan all day! Brigitte and I shared a little grin while we looked at the cocktail menu. All were expensive beyond my wildest dreams, but since it was a special trip, and we'd had a great day, we splurged and each ordered a fancy cocktail. Mine was a delightfully refreshing gin cocktail involving cucumbers. I wondered how they got this amazing essence of cucumber into the drink, and asked the woman behind the bar how it was done. She smiled and said that that they utilized the services of a mixologist for that cocktail and she was not at liberty to tell me their secret, which cost them a lot of money. I imagined all kinds of special techniques involving scraping the inner side of the skin of the cucumber to spritz precious flavorful oils across the top of the icy glass. A clear taste memory of the drink has come to mind from time to time over these last 5 years. One of those "I must figure out how that's done" kind of thoughts, on hot summer days, mostly. Fast forward to this summer. We're up in the mountains, where a couple of months ago, I planted cucumbers and we left them to tend to themselves. 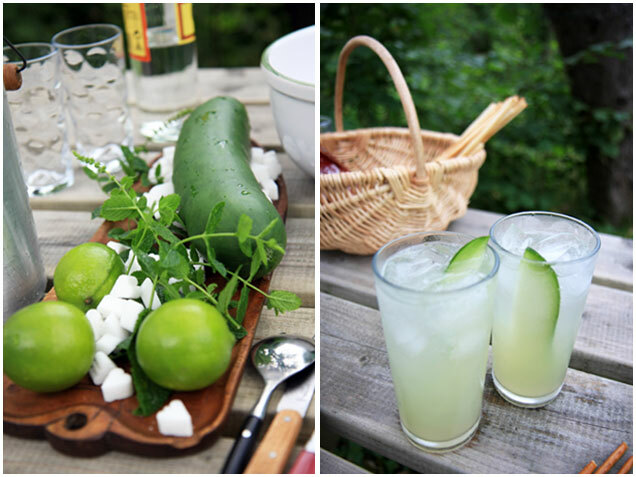 The two plants have flourished and each time we come up, we're treated to the most delicious cucumbers. When you crunch into a fresh picked home grown cucumber fresh from the vine, you come to understand why people just call them "cukes". The sublimity of the gustatory experience is so jarring, so refreshing, that it simply boils down to a single syllable in your mind. Oh look what I found! The cocktail! I fixed mine with ordinary gin, good juicy limes, a generous handful of suit shaped sugar cubes I had hanging around from a card playing weekend, fresh cukes, and mint plucked direct from the garden. It's exactly what they were serving in that cocktail bar. It turns out that the original recipe was submitted by a curator (obviously a man of good taste) named Adam Frank who entered a New York Times readers drink contest in 2006. It's too bad that owner of that cocktail bar didn't read the newspaper, he could have saved himself a lot of money. I plan to prepare it for everyone I know. You should too. The Cuke, Original Recipe here, for which I think I paid something like 11 dollars for one in New York City. Serves 3-4. Wash the limes, cucumber, and mint. Slice one and a half of the limes, and put them in a big bowl. Do the same for half the cucumber. Squeeze the rest of the limes and add the juice. Add the sugar cubes and the mint leaves. Take a spoon and crush it all up until it begins to render a good deal of juice. Add the gin to this, stir it up, and then transfer everything into a container you can put into the refrigerator. Chill for 30 to 45 minutes. I suppose you could chill this longer if you're getting ready for a party. 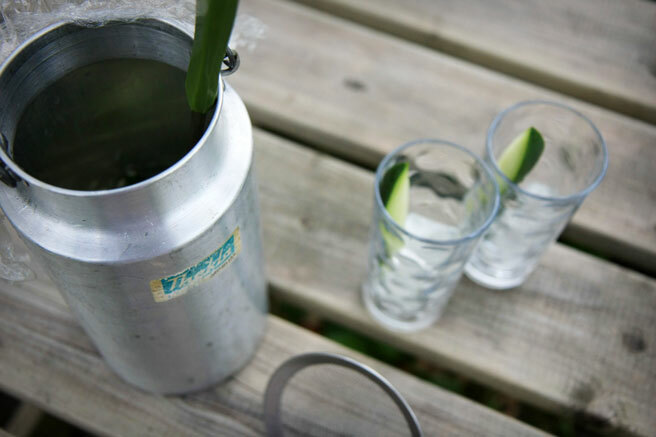 When you're ready to serve the cocktail, fill up tall glasses with ice, a long thin slice of fresh cucumber, and strain the mixture over the ice until it's about on half to two thirds full (depending on your guests). Top with Perrier (or any soda water you have), and serve immediately. Delightful. A beautifully refreshing cocktail indeed! May I serve you a Cuke, Ma'am?" I'm not a gin person, but I'd love to just hold a glass and inhale all that GREEEEN fragrance, enjoying the chill through my fingers. We used to serve "Watermelon Punch" with or without alcohol, made of strawberry syrups, and many slices of cucumber floated in the bowl. Summer in a glass? Try HEAVEN in a glass! I'll be making this immediately; it sounds lovely and refreshing! This sounds delicious . Should it ever get warm I'll make a big jugful . Those little cucumbers from the Turkish shops might be nearly as good as yours . 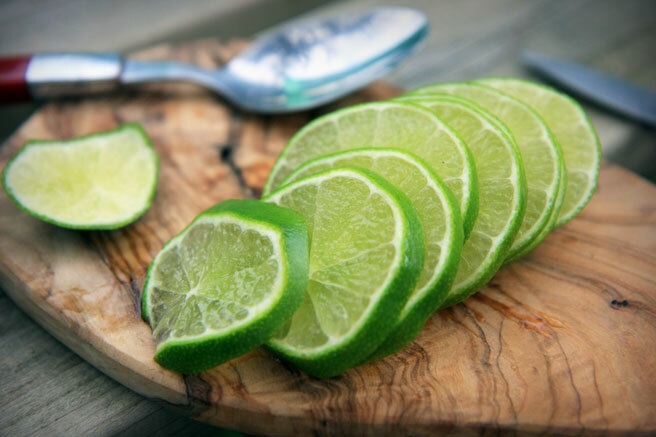 What gorgeous limes; so lovely. My culinary school chef was right, we do eat with our eyes! You are so right about freshly-picked, garden-grown cucumbers. It's like they are a different species than the cukes from the grocery store. So much better!